During the post-World War II years, the USA spent a great deal of money and manpower to help our former enemies rebuild their economies. One of the projects in Japan was the re-establishment of the ceramics industry. While Japan had a centuries-old tradition of ceramics (stoneware, china, porcelain) ranging from functional to decorative before the war, many factories were damaged during the fighting and skilled workers were in short supply. At war’s end, former factory workers and artisans started finding their way home and began to take up their jobs in the ceramics industry. Americans back home were, at first, reluctant to buy products from Japan. The main outlet for them was the PX, or post exchange: the store on the base where military personnel and their families shopped. Our GIs felt that helping the Japanese rebuild their economies included being their customers. By about 1948 American ill will against the Japanese people had subsided enough that goods from Japan were once again welcomed in USA markets. 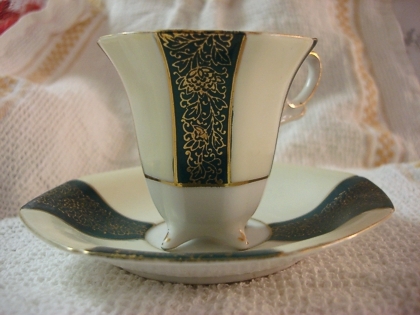 An Occupied Japan cup and saucer that I found in a local antiques shop several years ago. Ceramics produced in Japan between 1945 and 1952 were identified as being made in occupied Japan. Most of the pieces bear markings of this period: Made in Occupied Japan, or just Occupied Japan. Because this period lasted less than seven years, many of the pieces created during the occupation have become rare and quite valuable. Ceramics require two firings (baking in a super-hot oven called a kiln): the first, or bisque, firing that produces a solid, semi-porous object; followed by the glaze firing, in which a combination of minerals applied to the object and then heated become vitreous, thus rendering the object impervious to liquids. The ceramics created in Occupied Japan were generally made of a white clay, or kaolin, which is used to produce porcelain. Most of the objects, however, were produced as china, which is fired at a lower temperature than porcelain. While the majority of Occupied Japan china comprised figurines or other figural items (mugs, salt and pepper shakers, vases, and the like), a great number of tea wares were also produced. Many of these took the form of miniature tea sets and children’s tea sets. You can also find a few teapots and full-size tea sets. The majority of tea wares produced in Occupied Japan, however, were teacups – and some very beautiful ones at that. Occupied Japan china can be found at antiques and collectibles shops, yard sales, and via online sellers, and vary widely in price. Be sure to look for the identifying marks stamped on the bottom. Although there have been some forgeries, most objects carrying the Occupied Japan stamp tend to be genuine. On the other hand, some Occupied Japan china is, unfortunately, not marked as such, and requires a ceramics expert to correctly identify it. There are also some specific factory names you can look for: Ucagco is one of these. Other pieces are signed by the individual artisan. As with all fine collectibles, it’s up to you to decide whether it’s worth the asking price. Once you find a piece that you love, the answer will be “yes” and you’ll be adding a beautiful piece of history to your tea ware collection. The story of how a British princess brought tea to Romania begins in 1874 when Queen Victoria’s son Alfred, Duke of Edinburgh, married the daughter of Russia’s Tsar Alexander. The duke and duchess’ eldest daughter, Marie, was born a year later. A bright, free-spirited girl, Marie was blessed with exceptional beauty and was gifted with talents for writing and art. Admired as the most beautiful princess in Europe, Marie had many suitors. Her mother was determined to see her eldest daughter on a European throne, and so Marie was married off at age seventeen to Prince Ferdinand, nephew and heir to King Carol of the far-away country of Romania. The transition to a new country, language, husband, and family was difficult and lonely at first for the young princess. She found solace in solitary tea times in a private corner of the palace. By the early 1900s Princess Marie had entered the royal social scene, hosting English-style afternoon teas at the royal palaces. Knowing her fondness for both the beverage and the ceremony, Marie’s wide circle of friends and admirers would often arrange teas in her honour, and afternoon tea became popular amongst Romania’s upper classes. Marie’s children grew up with tea just as their mother had done, with a blending of English and Russian tea customs. Each day Marie would set aside time for tea with one or more of the young princes and princesses, with either the teapot or the samovar. Ferdinand and Marie became King and Queen when Carol died in 1914 on the eve of The Great War (WWI). During the war Marie distinguished herself as a nurse, establishing a hospital and visiting the most seriously wounded and gravely ill soldiers of the Romanian army. She taught her youngest daughter Ileana the English custom of bringing tea to the troops. When the war ended, Marie was sent to help represent Romania’s interests at the Versailles peace conference in 1919. From Paris, Marie went to London to plead Romania’s case directly with her cousin, King George. Of the many Romanian royal palaces, Marie’s favourite was Bran. This imposing medieval fortress sits atop a hillside overlooking a pastoral village surrounded by a sprawling park. (Bran is passed off to tourists as Dracula’s Castle.) In an area nearest the castle she built a teahouse where she regularly had tea with family or visitors, gazing out on the park’s gardens and small pond. Marie, Queen of Romania, died in 1938. In many ways she was the Princess Diana of her day. Even today, Romanians hold a place in their hearts for the memory of this extraordinary queen for her beauty, talent, and tireless service to those in need in her adopted country. First off, I want to make it clear that Chanukah is not “the Jewish Christmas.” The fact that these two holidays generally happen around the same time of year does not mean that they are in any way related. Christians celebrate Christmas as the birth of their Messiah. Chanukah is a celebration of the Jewish victory over the invading Greeks, and the miracle of one day’s worth of holy oil lasting to light up the Temple for eight days. Christians have their holiday. Jewish people have theirs. The tradition of giving gifts on Christmas derives from the gifts brought by the three kings. There is a tradition of giving on Chanukah too, tho’ generally we give money rather than gifts, usually in the form of coins, and as a reward for studying Torah (the first five books of the Bible). One gift tradition that is shared on both holidays is giving to those in need. Giving to charities does not mean that you can’t also give a gift to friends celebrating Chanukah. If you don’t want to give real coins, you can always give foil-covered chocolate coins. 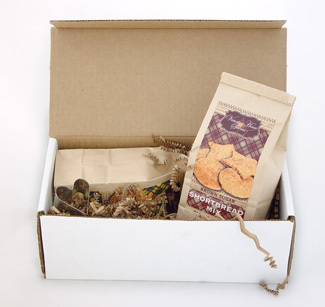 For a friend or family member who is a tea lover, you might want to give them a gift of tea or a “munch” to go along with the tea. 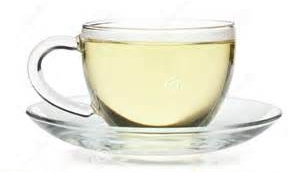 One of the original kosher tea companies is Wissotsky, which has been in business since 1849. They carry a wide assortment of teas and tisanes in traditional and pyramid-shaped teabags, and offer a number of gift collections. For the tea lover who prefers loose leaf tea, try these two of my favourite vendors. 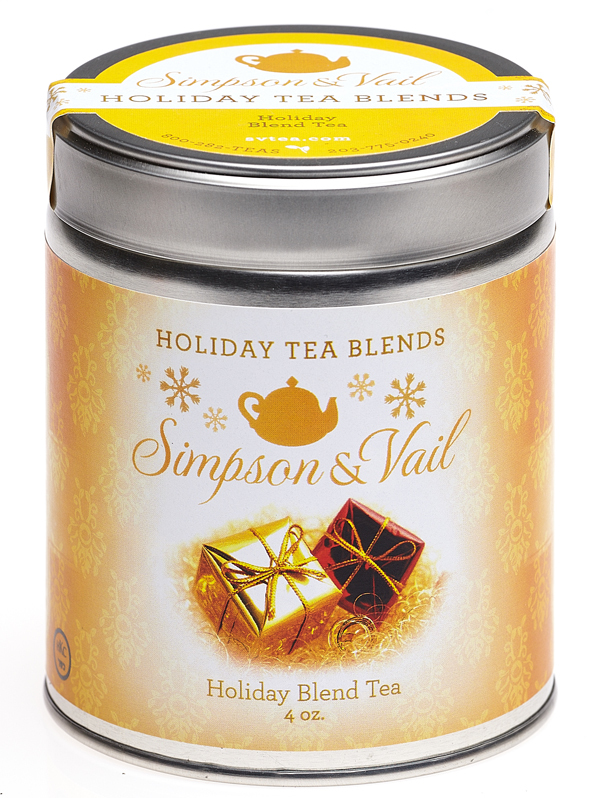 Simpson & Vail received their kosher certification last year and offer a large selection of excellent, high-quality teas and tisanes, including exclusive blends. You’ll find another wide selection of kosher teas at Harney & Sons. 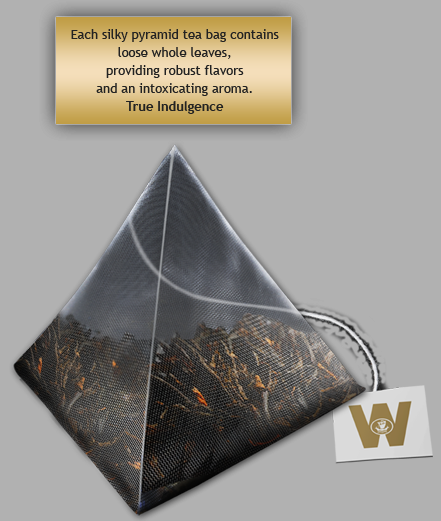 Both merchants also carry better-quality teabags and pyramid teabags as well as gift boxes. One caveat is that they also carry products from other manufacturers and these may not be kosher; read the product descriptions! Chanukah begins this year at sundown on Wednesday, November 27th, and continues through nightfall on Thursday, December 5th, so you have plenty of time to order and give kosher Chanukah gifts. 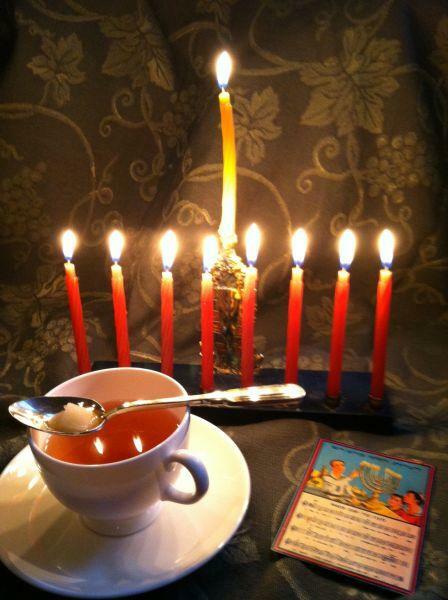 Now I’d like to leave you with this story of a very special and beautiful Chanukah tea tradition. By the 1790s, Jewish people in Russia were subject to many restrictions. Most Jewish people were banished by 1799 by Catherine the Great to the Pale of Settlement — an area encompassing parts of Russia and Poland. They were forbidden to practice most of the more lucrative professions, with the result that most of the Jewish population were deeply impoverished. Only a small number of Jewish professionals — physicians, for example — were permitted to stay in the cities. It was they who developed this lovely Chanukah ritual: Each guest was given a glass of tea and a brandy-soaked sugar cube on a spoon. The sugar cubes were then lit on fire. The guests held the flaming cubes while they sang Chanukah songs. When the songs were finished, all of the guests simultaneously dropped their flaming sugar cubes into their tea — and then stirred the tea and drank it with great enjoyment. This lovely tradition is still practiced in some communities, and is a fitting custom for a holiday known as The Festival of Lights. Contact us (by email or via the form below) about reviewing your tea or tea-related product, or to be interviewed. All content Copyright 2013 JP Badarau; all rights reserved. You’re welcome to send an email message to the author via this form; filling out this form will send an email message, it will not post a comment. If you’d like to leave a comment about this blog post for publication, please scroll down to the link that says “Leave a comment.” Many thanks.